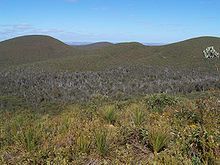 A heath (/ˈhiːθ/) is a shrubland habitat found mainly on free-draining infertile, acidic soils and is characterised by open, low-growing woody vegetation. Moorland is generally related to high-ground heaths with—especially in Great Britain—a cooler and damper climate. Anthropogenic heath habitats are a cultural landscape that can be found worldwide in locations as diverse as northern and western Europe, the Americas, Australia, New Zealand, Madagascar and New Guinea. These heaths were originally created or expanded by centuries of human clearance of the natural forest and woodland vegetation, by grazing and burning. In some cases this clearance went so far that parts of the heathland have given way to open spots of pure sand and sand dunes, with a local climate that, even in Europe, can experience temperatures of 50 °C (122 °F) in summer, drying the sand spot bordering the heathland and further raising its vulnerability for wildfires. Referring to heathland in England, Oliver Rackham says, "Heaths are clearly the product of human activities and need to be managed as heathland; if neglected they turn into woodland". In recent years the conservation value of even these man-made heaths has become much more appreciated,[why?] and consequently most heathlands are protected. However they are also threatened by tree incursion because of the discontinuation of traditional management techniques such as grazing and burning that mediated the landscapes. Some are also threatened by urban sprawl. Anthropogenic heathlands are maintained artificially by a combination of grazing and periodic burning (known as swailing), or (rarely) mowing; if not so maintained, they are rapidly re-colonised by forest or woodland. The re-colonising tree species will depend on what is available as the local seed source, and thus it may not reflect the natural vegetation before the heathland became established. ^ Polunin, Oleg; Walters, Martin (1985). A Guide to the Vegetation of Britain and Europe. Oxford University Press. p. 220. ISBN 0-19-217713-3. ^ Anon. "Heath and Moorland". Field Studies Council. FSC. Archived from the original on 4 October 2013. Retrieved 4 October 2013. ^ a b "Montane fynbos and renosterveld". Terrestrial Ecoregions. World Wildlife Fund. ^ Dennis, Roger L.H. ; Sparks, Tim H. "When is a habitat not a habitat? Dramatic resource use changes under differing weather conditions for the butterfly Plebejus argus". Biological Conservation. 129 (3): 291–301. doi:10.1016/j.biocon.2005.10.043. ^ Rackham, Oliver (1997). The History of the Countryside. Phoenix. p. 282. ^ "Dartmoor fire 'largest in years'". 7 April 2013 – via www.bbc.com. Wikimedia Commons has media related to Heathland.